Located in the north side of Texas and south of the United States, Arlington is the major city of Tarrant county of Texas. 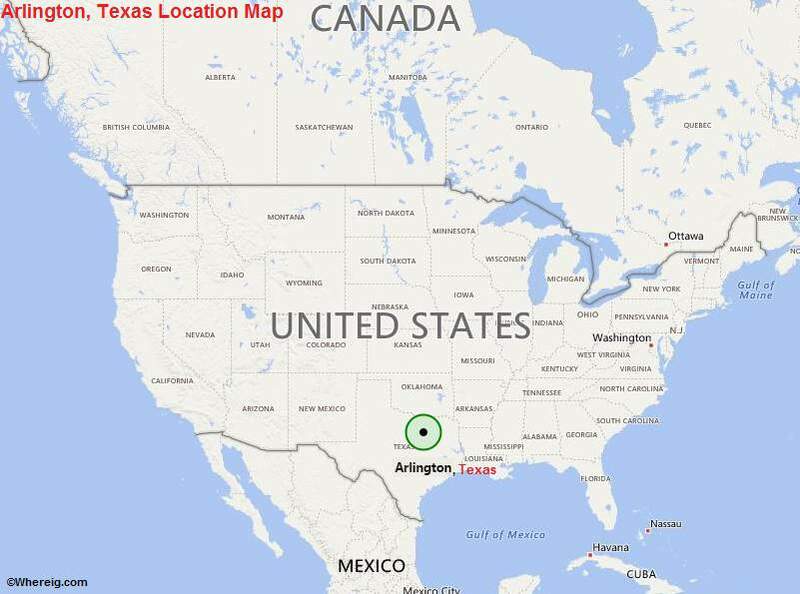 About Map: Map showing the Location of Arlington, Texas in the US. With the metro city population of 6,145,037, Arlington is the seventh largest city of Texas State and 50th largest city of the United States. Arlington shares its boundary with Grand Prairie, Kennedale, Fort Worth, and Mansfield. Furthermore, Arlington is the largest city of the United States that has not public transit system. Arlington is the largest city in Texas which has not a county seat. Though, the city is located between the cities Fort Worth and Dallas at the distance of about 20 km and 32 km accordingly but it has also various attractions; city homes University of Texas at Arlington (it is of doctoral-granting institute), assembly plant of General Motors, Cowboys Stadium, International Bowling Campus, International Bowling Museum, and it is also the headquarters of Nuclear Regulatory Commission Region IV. The city Arlington was established in the year 1876 and incorporated in 1884. It has been named after the name of General Robert E Lee's Arlington House. Primarily, city has been grown as the cotton farming and cotton ginning centre. Today, it has quite developed economy based upon industries and services.